In blues and folk music, one figure that stands out among the rest is Josh White, who rose from poverty to become one of the most popular Piedmont blues players of the 1930s, and eventually a major force in the folk music scene of the 1940s. Joshua Daniel White was born on February 11, 1914 in Greenville, South Carolina, one of four children in a religious family. When Joshua was a child, his father was beaten severely and later admitted to an asylum after evicting a white bill collector from his home. Not long after, the young Joshua began acting as a “lead man” for blind musicianer “Big Man” John Henry Arnold, and later for other blind musicians, including Blind Blake, Blind Joe Taggart, and Blind Lemon Jefferson. While on the road with those accomplished bluesmen, the young White picked up their guitar stylings, and soon became an accomplished player of the instrument. His talent was recognized in 1928 by Paramount Records’ J. Mayo “Ink” Williams, who hired him to record as a session player, backing up Taggart and white country musicians the Carver Boys. In the early 1930s, White was tracked down by the American Record Corporation to make records for their budget labels. His mother allowed him to record for them on the condition that he did not play the “devil’s music”—blues. White had his first session for the ARC on April 6, 1932, recording both blues and sacred music under his own name and the pseudonym “Pinewood Tom”. Though only a teenager, White became one of the most popular Piedmont blues musicians of the day, along with Buddy Moss and Blind Boy Fuller. Early in 1936 however, he was forced to temporarily retire from music after an injury in a bar fight, caused him to lose the use of his left hand. After a stint as a dock worker and elevator boy, White regained full use of the hand during a card game, and returned to music. By the 1940s, White’s style had shifted toward folk music, ascending to a status contemporaneous of Lead Belly, and he recorded with the likes of Pete Seeger and Woody Guthrie with the Almanac Singers, and the Golden Gate Quartet. He also became an accompanist to torch singer Libby Holman in an unusual pairing. During those years, White became the closest black friend of the Roosevelts, beginning with their meeting in 1940. His left-leaning politics gained him trouble with McCarthyism in the late 1940s, harming his career. Later in life, White was plagued by a worsening painful fingernail condition. He died of heart failure in 1969. Oriole 8159 was recorded on April 12, 1932 in New York City by Joshua White, one of his earliest sessions for the ARC. On both sides, White is accompanied by an unknown piano player. It was also issued on Perfect 0213 and Banner 32527. 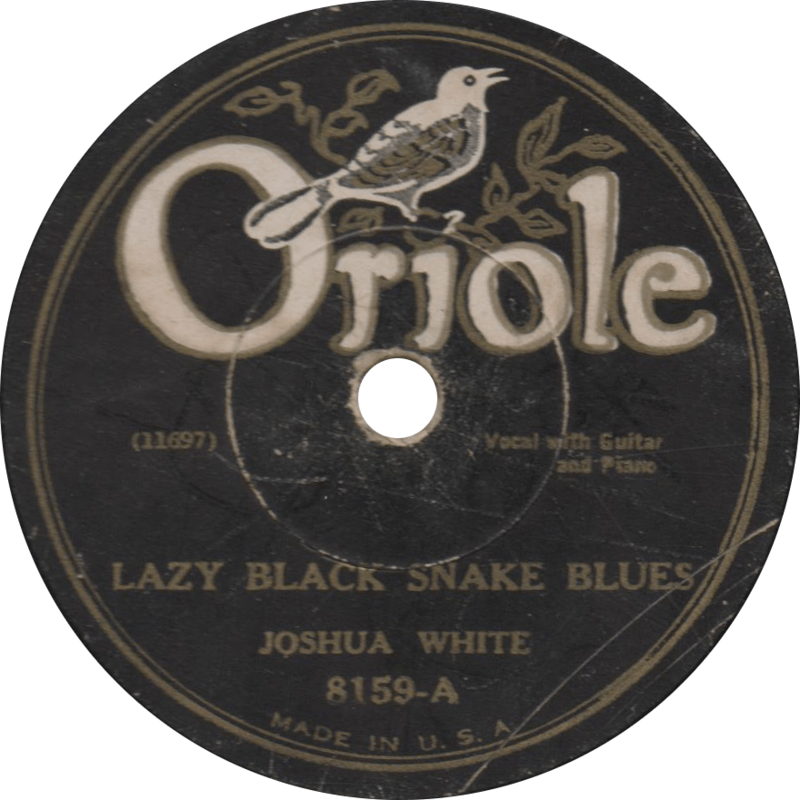 Lazy Black Snake Blues, recorded April 12, 1932 by Joshua White. On the other side, White sings of woes with his woman on “Downhearted Man Blues”. A common theme in the blues. Downhearted Man Blues, recorded April 12, 1932 by Johsua White. This entry was posted in Records and tagged 1930s, 1932, ARC, Blues, Josh White, New York, Oriole, Piedmont, Race Record by R. Connor Montgomery. Bookmark the permalink. That fingernail condition was Psoriasis. I have it as well.